You can view all rubrics and artifacts that are aligned with a specific outcome. Click the outcome you want to view . To view all aligned items, click the name of the outcome . View the assessments and activities aligned to the Outcome. Aligned Items are identified with an icon displaying the item type: rubric  or assignment . This change helps identify the item for easier management within outcomes and clarify items that have similar titles. Aligned items also show whether the item can be removed from the outcome. Alignments displaying a rubric type display a blue remove icon . Clicking the rubric name will open the rubric, where you can edit the rubric or delete the rubric. Alignments displaying an assignment type display a gray lock icon . Gray icons mean that the aligned item cannot be removed because it is associated with a rubric. To remove the aligned item, you would have to open the rubric and remove the row that is associated with the outcome. 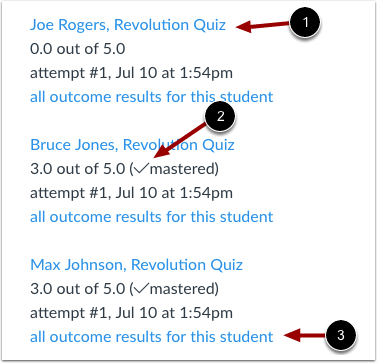 Under Outcome Artifacts, you can view the progress of individual students on each artifact (the aligned assessment or activity). You can view the student response details by clicking the name of the assignment . The Check Mark icon  signifies the student has received a high enough score to satisfy the outcome threshold value. 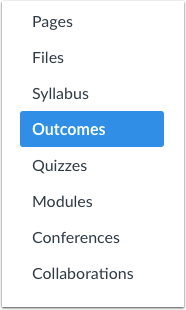 If you want to view all outcome results for a specific student, click the all outcome results for this student link . Previous Topic:How do I find Learning Standards to add to a course-level outcome? Next Topic:How do I use the Learning Mastery Gradebook to view outcome results in a course? Table of Contents > Outcomes > How do I view all aligned items and artifacts within an outcome? Re: Is there a way to view which assignments rubrics are assigned to? Re: Is it possible to report on content alignment in a course or sub-account?